Oliver Brown says he gained huge self-belief from thrashing world number three Ding Junhui 5-0 this season and is eager show it was not a one-off when the UK Championship begins. The Derbyshire amateur plays Mark Selby in round one in York on Wednesday. And he insists he is not daunted by the prospect of facing the world champion. "I played the best game of my career against Ding. It spurred me on. It gives you masses of confidence winning like that," Brown told BBC Sport. "I've had a quite a few pros saying they would have loved to have had a win like that, so facing Mark is not something I worry about." "I went in with no pressure against Ding since then I have had a few good wins this season." The 20-year-old followed his win over Ding at the Wuxi Classic in China with victory over Oliver Lines, before losing to Martin Gould in the last-32 stage. His form in the first ranking event of the season set the tone for an encouraging showing at the Australian Open where he beat Andrew Norman, Dave Harold and Gary Wilson. "I went in with no pressure against Ding since then I have had a few good wins this season," Brown said. "I have been putting the work in, practising hard every day and going to the gym three times a week. "I want to give myself the best possible chance. If I lose, then as long as I am putting in the hours, I can deal with it." 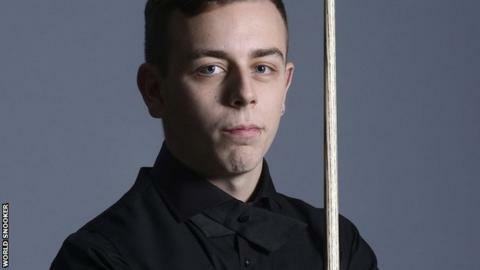 Brown started playing pool at the age of seven and took up snooker three years later, before beginning to play "properly" at 14. "I was one of the more natural ones to it and I loved it straight away," he added. "I was at the snooker club with my dad every weekend. "It soon became my main hobby and now it's my career. But I don't feel pressure at all. I just enjoy it."